TL;DR: A perhaps too brief look at games from the lens of player uncertainty – how uncertainty affects players and how we might categorize it different types. A design theory book on an advanced topic, but lacking some meat. Uncertainty in Games attempts to take a single topic – “uncertainty” – and explore its role and meaning in game design. Costikyan, the author, is a fairly acclaimed designer – his essay “I Have No Mouth and I Must Design” (PDF) is a key reading for anyone looking at the history and evolution of the field of game design. In addition, the book was published as part of the Playful Thinking series from MIT Press (like Art of Failure, another excellent book). All together Uncertainty in Games seemed to represent a text that’s both practical and theoretical, with a dense deep dive into a singular topic. However, I felt the book ultimately fell short of that promise. The book is an analysis and catalogue of ways games create uncertainty in players, and why that is important to games. The end result is essentially giving designers a new lens (uncertainty) from which to look at and evaluate their games. The introductory chapters (only a few pages each) simply devotes itself to defining uncertainty and wrestling with various definitions of “game” or “play”, having a kind of dialogue with some of the more famous philosophers like Callois) in this field. This is the most academic part of the book in terms of tone and content, but still easy enough to follow along as someone not entirely familiar with the source references. “Games thrive on uncertainty, whereas other interactive entities do their best to minimize it” (p. 15). Chapter 4 starts really getting into the meat of the topic by doing an analysis of various types of games – digital and analog from very different genres – and looking at what role uncertainty plays in each. Chapter 5 follows up by taking this exploration of uncertainty and categorizing them into specific roles. This reads strangely as though the chapters are in the wrong order – most authors would define and categorize the theory and then use examples to support it. The result is the same though. solvers uncertainty, as in uncertainty in the challenge of puzzle-solving. The author favors puzzle-games like Lemmings where the puzzles develop emergently from the game’s mechanics over authored/contextual puzzles like in point-n-click games. uncertainty due to hidden information, such as Poker where you do not know the other player’s cards. This kind of uncertainty tends to encourage exploration and testing of the system. uncertainty of perception, such as in a Hidden Picture game, but also applied to games like Guitar Hero. There seems to be a heavy overlap between this type and performative uncertainty. narrative anticipation, especially in games where players can upset the balance and allow an underdog to win at the last moment. This is as opposed to a game like Monopoly where you know the winner fairly early on and it takes a long time to actually resolve the game. Uncertainty in Games fails to identify any kind of uncertainty we haven’t fully explored in games. Where do we go from here? What avenues have we yet to open up? With the exception of a nod at social games (the references to CityVille already unfortunately feeling outdated), there seem to be no new innovations in the way developers use uncertainty. The last chapter that covers games lacking uncertainty or the problem of excess uncertainty is too short to really dig into exception, contradictions, or problems arising from the gameplay element. My writing marks up many of the pages with questions, often pointing out seeming contradictions or statements that didn’t seem quite supported by my own experience or the rest of the text. For example, the authors says that endless games like World of Warcraft have uncertainty not in the outcome, but in the path the player takes. And yet he follows along saying puzzles are not games because they have no uncertainty – if you know X then you can derive Y. But I don’t see why even a simple jigsaw puzzle can’t have uncertainty in the path in the player takes, in which piece they solve next, in how the final picture is assembled. In fact, Costikyan seems to contract himself when he covers “solvers uncertainty” (p. 25) in puzzles. I am summarizing here, possibly unfairly, but this represents one of the many instances where I wanted to argue with the text and some of the grand statements made within it. I definitely had to resist the urge to nitpick the content in favor of focusing on the broader concepts. I could not help but constantly compare the way Costikyan treats uncertainty to how Koster focuses on patterns in his book A Theory of Fun For Game Design. 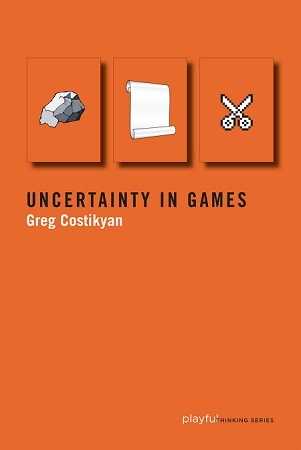 For Costikyan, uncertainty seems to be the key element in the design of a good game. For Koster, good game experiences come from experimenting with the game’s systems until they fully understand it (pattern matching), at which point the game because unfun. This period of play when the player is trying to understand the pattern – but doesn’t – is essential the period of uncertainty. These aren’t contradictory concepts but rather felt like two sides of the same coin. However, Costikyan never really talks about a game once it’s been mastered, or the difference between the first time playing a game and repeated playthroughs of games intended to be played once. I think that’s due to a (my perception) focus on analog games for good examples of uncertainty, or games that rely on algorithmic complexity (Dwarf Fortress). A game like Uncharted also has uncertainty – especially narrative uncertainty – but after completing it, that uncertainty largely vanishes. For a real deep dive into the topic, I’d expect the author to explore this situation and others that challenge or complicate the concept of uncertainty. Fairly or unfairly, I can’t help but compare this book to the other one I’ve read in the same series – Art of Failure by Jesper Juul. While I critiqued that one for being a bit meandering, it was extremely comprehensives, looking at the single topic from as many angle as possible. Ultimately that’s what’s missing from Uncertainty in Games and why it feels like it doesn’t go far enough. The book itself is a quick read – 114 pages, plentiful references, and not bogged down in complicated terminology nor does it feel dry like a textbook. While I think the content does require at least some experience in game design (as a student studying the field or developer practicing in it), I found it very easy to follow along. I would recommend the book if the topic specifically interests you but don’t expect to come away with anything particularly ground-breaking. Summary: Not recommended, unless you’re looking specifically for a lesson plan centered around classic Western quest narratives. Even then I think the book is unfortunately outdated. It’s not much of a secret that my favorite subject is the intersection between game design and narrative design, and back in the day I studied medieval literature, so I was definitely looking forward to reading Quests. On the surface it purports to be a text for game designers looking to add more meaning to their quest design, for academics to better understand how quests translate to games, and for students to practice design lessons. Unfortunately, I felt it failed at all three. The book is printed large like a textbook, but only clocks in at 230 pages. The structure starts off with an introduction to the topic and several chapters covering the main elements that make up a quest: spaces, challenges, objects, and characters. Each chapter is further divided in half between theory – the underlying concepts from both game design and literary studies – and practice – which takes the form of very specific technical tutorials for implementing that portion of the quest in the Aurora engine from Neverwinter Nights. Generally I think the book’s structure is solid and the division between theory and practice allowed me to skim the technical aspects, which I didn’t need, and focus on the theoretical ones. While the Aurora engine is old now and there’s better game development tools available to students for prototyping quests, I thought the lesson plan was fairly solid as a first game design project. However, it falls a bit short of challenging students to create meaningful quest content (it’s intended purpose) – instead I’d say it’s more of a technical introduction to building a quest with a checklist of game design elements. 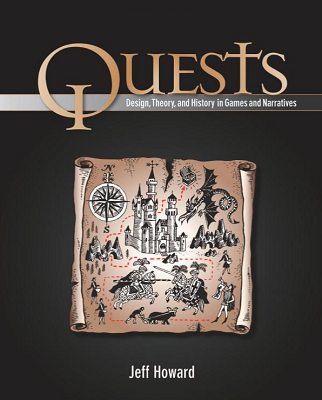 From the theory half of the book, Quests‘s main thesis appears to be that quests are a structure in literature and an activity in games, and that we can learn from a cross-pollination of literary and game studies to make more meaningful quests in our games. The author backs this up fairly solidly with a dissection of the quest archetype in Gawain the Green Knight (among others) and comparing its structure to common quests in games such as Ultima and World of Warcraft. A quest involves goals, the collection of certain magical items, NPCs that represent quest givers, monsters or tasks that provide challenge, and a healthy dose of symbolism. Unfortunately I felt the book was a failure. Its lessons on game design were very basic, more appropriate for a student audience than practicing designers. His explanations of quests in a literary sense did not provide much practical insight. Austin Walker wrote a very good review of the book for First Person Scholar – I highly recommend it as he goes deeper into why the book feels so outdated compared to the modern landscape of meaningful game narratives. From a game design standpoint, there was really nothing new I could take away. The author’s definition of quests narrowed down the possible content to a focus on a handful of medieval fantasy role-playing games with western cultural traditions – like Ultima – excluding Japanese role-playing games with obvious quest narratives or games from other genres (Call of Duty is certainly structured like a quest). The author is also quick to dismiss Diablo and other action-oriented RPGs from this limited view, giving readers even less opportunity to apply any insights widely. I can’t really recommend the book for anyone – not academics, game designers, nor students. I think the topic – quest design – is still really relevant to game designers, but probably needs to be written from a much more practical point of view, and one that incorporates the wider palette of games that involve quest narratives. Summary: Very short introductory book on traditional role-playing game design considerations. Not bad if you know nothing about RPGs and need a quick primer, but not recommended for serious reading. This will be a short review since the book is rather short. Fundamentals of Role-Playing Game Design one one of a larger series of short ebooks that Ernest Adams has written covering different genres of games, such as sports, strategy, simulation, puzzles, and so on. The book is very short – a little over 50 pages – and only available in ebook format. Out of all the books I’ve collected, I have not found any that seek to go into detail on a single genre and dissect that from a design point of view. When I stumbled upon Adams’s collection of titles that seemed to cover exactly that I decided to pick one of them up and review it to see if it was worth diving into the series. After this one, though, I probably won’t pick any of the others up. Fundamentals of Role-Playing Game Design reads like an introduction to the genre to someone who has never played a role-playing game before but has some knowledge about games or gameplay. It is very basic and only covers fairly traditional role-playing game design conventions (dice rolling, character sheets, magic systems), covering mainstays like Dungeons & Dragons or Planescape: Torment. The book acts as more of a survey of what is done, why, and when some decisions are better or worse than others – for example, different inventory management strategies or dialogue/story branching structures. The book could have been much longer, and I was hoping it would have a more solid foundation on role-playing games including tabletop and LARPing. The author alludes to these and other considerations but claims that there’s not enough room in this book to cover them in depth. I wouldn’t recommend the book for active game developers or people who know a lot about the genre. As a student I may have found a book like this on strategy games (which Adams has also written) helpful for getting me up to speed on a genre of games I had practically zero familiarity with at the time. 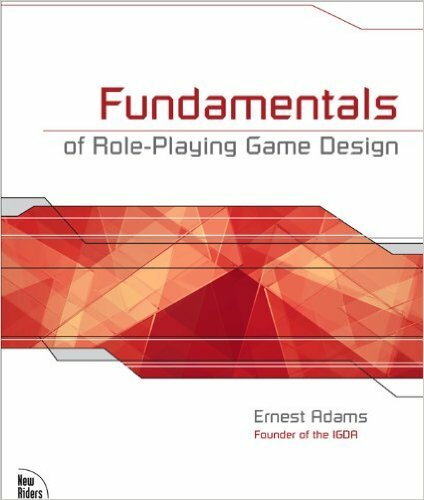 I suspect that the series is meant as individual supplements to follow-up from Adams’s Fundamentals of Game Design, a much larger and more comprehensive textbook. The book ultimately fails for me because it is just too short to do the topic justice. A book on role-playing game design could easily fill an entire textbook and even knowing the page count ahead of time I found myself disappointed. Summary: Excellent introduction to game design fundamentals, focusing on board games, but the real value lies in doing the challenges packed throughout the book. Challenges for Game Designers is a very solid fundamentals book that covers key design concepts without relying too much on technology. The authors both have a really solid, practical background in game design as well as experience in academia and as a book on teaching game design I think it holds its own nicely next to similar books like The Art of Game Design. It is, though, an introductory book and as such it touches on many familiar aspects of game design without going into any with too much depth. 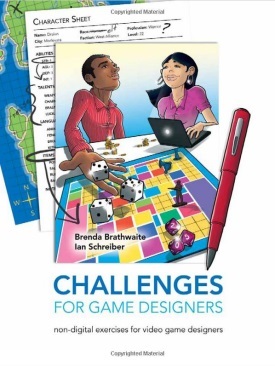 The book appears to be written with one goal in mind: teach game design through board game practices (“challenges”) in a way that is practical for students, educators, and existing designers all at once. While the first chapter exists to just get readers feet wet in figuring out what game design is and isn’t, all the following chapters cover discrete subjects like puzzle design, chance, strategic skill, multiplayer, sequels, art games, and so on. Though the content of the book often overlaps other introductory game design books, the topics the authors picked for their chapters differ a lot. For example, there’s an entire chapter called “Converting Digital to Physical” and another called “But Make It Multiplayer”. These chapters are obviously written specifically with the challenges in mind, but the side effect was some different content organization and shifting emphasis onto certain topics compared to other books. At the end of each chapter are five challenges with a range of difficulty and time commitment. These challenges are not just simple statements but also walk readers through them, starting with research and usually ending in either a board game prototype or an in depth design document. Examples of challenges would be to design a sequel to Monopoly, redesign Monopoly for a different IP, modify a game of solitaire to be multiplayer, as well as more open designs such as create a race-to-the-finish style card game. All of these challenges are non-digital, which makes them both very accessible to readers without requiring technical skills and keeps the focus of the challenges on game design, not the art or code required to get the game working. These are also not just game design documents but working prototypes, which avoids the issue of “good on paper” design that can distract a lot of students from exploring the dynamics that arise from actual play. Personally, I found about one challenge per chapter interesting enough that I plan to set time aside to do them – and I gained a lot of value from the two I did complete on my own before writing this review. The rest of the challenges either didn’t really pull me, or the scope was too large for me to fit it into a reasonable evening. I think the challenges, though, are diverse enough that most designers will find one worth exploring on each topic. Keep in mind that the challenges are obviously written mainly for the classroom, which means a lot of suggestions for organizing or competing teams or different ‘deliverables’ that are more like school assignments. While other books, like A Game Design Vocabulary, also have design exercises at the end of each chapter, I think Challenges for Game Designers comes across much stronger in this area due to the emphasis on those exercises and the way it leads readers through them step by step. The book is easy to read, fairly short (as far as textbooks go, I read this one over the course of four days) even though it clocks in at a full 300 pages. It has a personable style – but not quite as anecdote heavy as The Art of Game Design. The content favors breadth rather than depth, introducing many key design elements but not really going into them in enough detail. However, I feel that the challenges make up for this since many (perhaps all) of them include a research phase and that is where I feel readers can fill in the missing parts of their knowledge. I think it’s is starting to show its age a bit with lots of references to Facebook games but little on mobile, and it would benefit from a chapter and challenges on free-to-play/monetization design by now. There’s also a chapter on “art games” that, while well written, also feels a bit outdated compared to recent trends in art games, alt-games, experimental games, and the wider indie scene. (It is surprising how much can change in six years). As someone who has been looking for examples of “deliberate practice” – activities I can engage in as a game designer to improve my skills – Challenges for Game Designers is very useful and I know I will continue to refer back to it for the occasional board game design activity. All the strength of the book lies in its challenges, and if you read it without doing the practices then you are probably wasting your time. If you don’t have time to commit to board game design exercises, then skip it. I am even tempted to describe it as a “workbook” instead of a “textbook” to drive home that this is not really a book you read so much as a book you work through. I think Challenges for Game Designers would be an excellent choice by aspiring designers as a self-taught course, or used by educators to help develop a game design curriculum. The content outside of the challenges is too rudimentary for me to recommend much to experienced designers as reading material – you will get much better mileage out of a more dense, more advanced book on game design. Personally, while I love the challenges, I was disappointed in the lack of depth, though part of that is driven by the number of intro-to-game-design books I have read already. 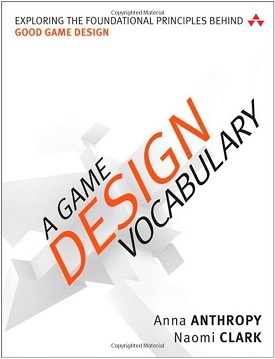 Summary: A straight up game design text that attempts to break games down into parts using new vocabulary. A very solid, practical, design-specific text recommended to students and aspiring designers. I’m surprised the book is as unknown as it is – I wouldn’t have looked at it except that I recognized the authors, and hadn’t heard about it from anyone else. It’s not an especially long book – at only 209 pages with many images interspersed with text – so it doesn’t take very long to get through. I enjoyed A Game Design Vocabulary quite a lot, and there’s several nuggets of wisdom that I found myself immediately using in my work after reading them. I don’t think it’s perfect and I feel it better serves aspiring designers rather than seasoned vets, but if you don’t mind wading through a lot of common knowledge to get to the interesting bits scattered throughout then I do recommend it. Instead, A Game Design Vocabulary presents a really simple, meaningful, and incredibly useful way to look at games. Rather than replacing terminology, it adds its own layer as a way of lumping several concepts together under a unifying term. This separate terms like challenge, difficulty, etc. are all part of a larger concept called “resistance”. Levels, missions, arenas, boards, and so on are grouped into “scenes”. The point behind this thinking, which the authors make clear early on, is that many games now no longer follow traditional mainstream game formulas. We have games that do not have difficulty levels or specific challenges or even goals, without scores or levels or missions or quests, but we haven’t really evolved our vocabulary to deal with them. When we talk about “levels” in a game, that implies a lot about the gameplay. But how do you talk about levels in a Twine game? This is where a new, centralized set of vocabulary really shines. With terminology that can apply equally to Call of Duty, Pacman, Dear Esther, or howling dogs, we can actually compare them to one another and talk about them in meaningful ways without getting bogged down in “levels” or “missions” or “difficulty”. The other advantage with this vocabulary is that it frees designers from thinking within boxed terms. As I mentioned, I believe words have a lot of power, and when you do not have a word for a thing it can be hard to describe it. We see this effect in the genres were make (platformers, shooters, etc.) being prescriptive – we copy others without creating on our own. This new vocabulary gives more general – yet still specific – terms for the atoms that make up a game, and in a way that is actually practical and useful. Those vocabulary examples I used – scenes and resistance – are the two terms I find the most effective, but there’s lots of other vocabulary presented. Some of that vocabulary is more useful in my opinion than others. The term “conversation” to refer to the feedback loops between the player and the games system is interesting, and good for new designers to help them think of systems as dialogues, but ultimately not one I’ll probably adapt into my own games lexicon. There’s also some specific design thoughts in the book that I disagreed with, but none worth really highlighting in a review – just because I disagreed didn’t mean that they weren’t well argued. Each chapter defines a term, gives examples of how to use that term and how it relates to previous terms, and finishes with discussion prompts and activities that help reinforce the lessons. Vocabulary isn’t about dictionary definitions but rather large concepts with a single unifying term behind them. I don’t want to give you the idea that the book is only about vocabulary, rather than about major principles in game design. It really takes you into very specific examples of games and how and why an element is designed in a specific way for the benefit of the player. It details why a designer might place a platform here instead of there and all the ways that affects a system. It covers many concepts by talking about their role in games and how they affect players – like achievements, scores, flow, grinding, cameras, cutscenes, iteration, pacing, branching stories, and so on. Each piece of vocabulary or concept comes with specific examples, which vary between the author’s own work and popular but niche indie games, though occasionally pointing out a more mainstream game that illustrates a specific concept well. I’m aware of most of these indie games, but many readers won’t be, so that might put off some people. However, each example comes with screenshots and plenty of details walking the reader through the design that I believe that even if you haven’t played the games being referenced you can still follow along. This kind of specificity is wonderful in a game design book, making the lessons practical and immediately actionable. However, it does mean that if you already grasp the concept then reading through the examples will slow you down and not impart much new information. I do recommend this book to aspiring designers since I think it can help newer designers become much more thoughtful about their work. I am neutral on recommending it to seasoned designers, though. The vocabulary is interesting and I feel the book is worth reading for that alone, but the examples and specific lessons are things good designers should already know and will retread a lot of ground. I personally didn’t find many of the examples all that illuminating – I chalk this up to experience, though. I think these examples and demonstrations of those parts of a game – verbs, rules, scenes, conversations, and so on – would be extremely helpful to those new to design without a lot of experience. (I also recommend Anna Anthropy’s blog, which often has great insights into design from someone who obviously thinks very deeply about it). I did feel that the book slowed down to a slog about two-thirds through and I had to force myself to finish it, but I can’t tell how much of that was interference from my own life, or if the book really did slow down. I do find Anna Anthropy’s writing absolutely engrossing and she was mainly responsible for the first half, while I’m unfamiliar with Naomi Clark, so it might just be the change in pace and writing style. I will probably do a fairer “which intro to game design book is the best?” article eventually, but right now I think A Game Design Vocabulary would work well as a complement to Art of Game Design. While the latter goes through many of the practical steps in the ecosystem of game development, making up for depth with its sheer breadth of game design topics, A Game Design Vocabulary just feels like it’s more about how to take specific design principles and put them into your (small, indie, or student) game. It’s hard to take the lessons from this book and, say, apply them to AAA design which has some very specific goals and restrictions, but students and indies looking at smaller projects would find the information very useful. I work full-time as a game designer at Ubisoft Toronto. In the past I've worked on games such as Sunset Overdrive and Scribblenauts. Journey Home Dev Update #2: Back to the Drawing Board. Literally.